THE TECH MUSEUM OF INNOVATION IN SAN JOSE IMPLEMENTS HITACHI’s µ-CHIP RFID TECHNOLOGY : News Releases : Hitachi America, Ltd.
BRISBANE and SAN JOSE, Calif., -- April 4, 2005 – Hitachi America, Ltd., a subsidiary of Hitachi, Ltd., and The Tech Museum of Innovation (The Tech) in San Jose, Calif., today announced the implementation of Hitachi’s µ-chip as the exclusive RFID technology for the museum’s TechTag-enabled exhibits. The µ-chip technology implementation went live at The Tech on March 29, 2005. The Hitachi µ-chip offered The Tech an opportunity to substantially lower the cost of its "TechTag" RFID wristbands while highlighting μ-chip technology in the heart of Silicon Valley. The Hitachi µ-chip RFID tag is small and inexpensive enough to meet The Tech’s requirements for short read distance item level RFID tracking applications. The Tech is the first museum to use disposable RFID wristbands as part of its interactive exhibits. Visitors receive TechTags, pre-encoded and pre-printed human readable wristbands, upon entering the museum’s galleries. 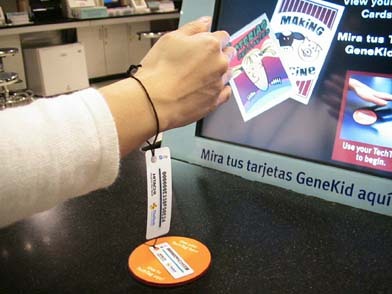 During their experience in the museum, visitors wave their wristbands in front of RFID readers at select exhibits to trigger various interactive experiences. Visitors are encouraged to keep their TechTag as a souvenir, and use it to log onto their own personal websites to extend their museum visit at home. Each guests’ website features their own experiences from The Tech, and also offers additional online-only content. Guests can add to their website by bringing their TechTags back over time for use with new exhibits. No personal identification information of the visitor is recorded. The Tech’s website also provides links to Hitachi Websites so that visitors can easily learn more about the µ-chip RFID technology in the wristbands. The µ-chip is completely passive; it obtains its power from the interrogation reader’s own radio signal. There are no batteries involved and so the µ-chip’s lifespan is expected to match the typical IC lifespan. The Hitachi RFID technology has unique characteristics that lend itself to very low-cost RFID tag manufacturing. The µ-chip IC (integrated circuit) is 0.4mm square. The efficiency result is that more µ-chips can be produced using the same amount of silicon. The µ-chip inlets are very durable. Failure rates recorded during the manufacturing process from raw inlet to TechTag have been exceptionally low. The µ-chip operates at the globally available 2.45GHz radio frequency which is a much higher frequency than typical RFID systems, including recent supply chain RFID applications that use tags that vary in radio frequency depending on individual country regulations. The higher µ-chip frequency permits a smaller and simpler tag antenna design. There are no metallic coils in a µ-chip antenna, only a straight 52mm x 2mm aluminum foil-based plastic strip similar to Christmas tree tinsel. The 2.45GHz frequency provides a very fast 20 microsecond read response time between the reader and the chip. The µ-chip is secure. Each chip contains a 128 bit unique identification code that is hard coded into read only memory (ROM) during chip manufacture. Any attempt to re-code the ID will damage the chip. Hitachi has provisions and systems in place to never release µ-chips with duplicate IDs, thus ensuring each µ-chip’s authenticity. The unique security attributes of the µ-chip make it an ideal vehicle for ticketing or loyalty program ID device. It is currently being used at the Expo 2005 Aichi in Nagoya, Japan for admission tickets. Hitachi’s Pavilion at the Expo can be previewed at http://hitachi-pavilion.com/eg/index.html. The Hitachi µ-chip is named after the 12th letter of the Greek alphabet, which is pronounced “mu” and a commonly used scientific abbreviation to describe one micron, a unit of measure equal to one-tenth of a millimeter. The communication protocol between RFID tag and reader is proprietary to Hitachi, Ltd. Located in the heart of downtown San Jose, Silicon Valley, Calif., The Tech Museum of Innovation, a non-profit organization, engages people of all ages and backgrounds in exploring and experiencing the technologies affecting their lives and aims to inspire the young to become innovators in the technologies of the future. For more information, visit www.thetech.org or call (408) 294-TECH.